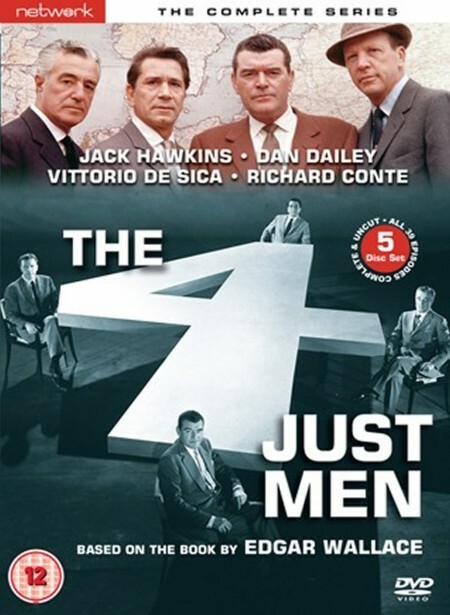 This ITC crime drama series, loosely based on Edgar Wallace’s novel of 1905, assembles an astonishing array of talent: Jack Hawkins (The Cruel Sea), Richard Conte (The Godfather) and Oscar nominees Vittorio de Sica and Dan Dailey star as the four men chosen to pursue justice and defeat tyranny worldwide; their regular co-stars include Avengers star Honor Blackman, as glamorous secretary Nicole, Lisa Gastoni, June Thorburn, and Andrew Keir (Quatermass and the Pit). The series’ cosmopolitan flavour and stylish settings paved the way for many later series that combined crimefighting adventure with the glamour of exotic locations and a touch of romance. The Four Just Men garnered rave reviews from critics and proved a major success for ITC, and is notable for a unique format in which each of the protagonists and their co-stars appeared in turn, in separate episodes and storylines. Judi Dench, Mai Zetterling, Alan Bates, Jane Asher and Patrick Troughton are among the guests making early television appearances in this classic series, first screened in 1959 and 1960, and now available for the first time on DVD. Four men who last met in battle during the Allied invasion of Italy in 1943 are summoned to Foxgrove Manor, to hear a message recorded by their wartime commanding officer, Colonel Bacon, shortly before his death. He appeals to them to form a quartet dedicated to fighting injustice and the abuse of power, and has bequeathed a large sum of money for that purpose. London MP and amateur sleuth Ben Manfred, American reporter Tim Collier, New York lawyer Jeff Ryder and Italian hotelier Ricco Poccari agree to carry out the Colonel’s dying wish, and their epic mission takes the Four Just Men across Europe and beyond.